To interact the widget with a digital funnel, in the manifest.json file, you must specify the scope of the digital_pipeline and the dp / settings block, for more information about the widget structure, see here. The endpoint digital_pipeline must be present in the widget.php file. 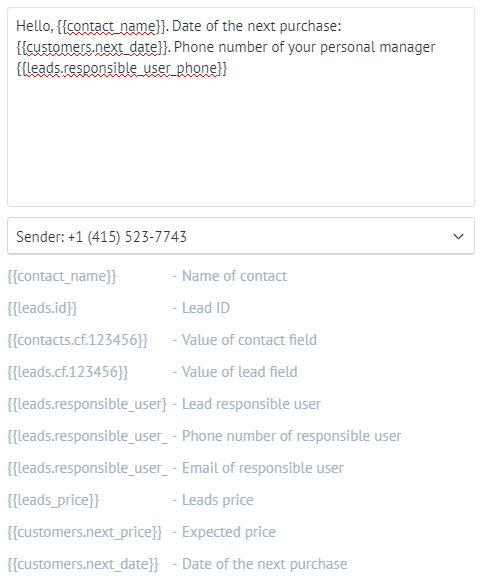 More information about adding leads through the API with a unique visitor ID can be found on this page. *In that case, when you specify action_multiple - true in the block dp of your manifest.json, then you allow to stretch (set) the action of your widget at once to several stages. If you change the status of the lead / buyer, in the area of the action of your widget stretched to several stages, type_code = 15 will come. At the same time, when the lead / buyer moves to the status in which your widget is activated, type_code = 14 will initially come. In the previous section, we talked about the need to have the endpoint digital_pipeline in the back-end file of your widget.php widget. This is necessary so that when a certain event occurs, your widget can receive information from the digital pipline. We exchange data from our side and your widget by sending notifications about events using WebHook technology (for more details on the technology, see here). Note that the WebHook from the digital pipeline is sent to the web server only once when the specified event occurs. In the example, we show an implementation of endpoint functions and methods for working with WebHooks, for a simple widget that sends a text message when a certain event occurs. When your widget is successfully added and is available for integration, access to its settings will be possible from several areas. First of all, access to the full configuration will be possible standardly, as for all integrations, from the Settings -> Integration section of your account. In the event that your widget is integration with the digital pipeline, then it will be accessed from the settings of the digital pipeline, section leads in the area of declaring automatic actions for all leads. This element is drawn by us, including the logo and the choice of the condition by which the action of your widget will be executed. On your part, you need to fill the element with quick settings or select actions that will be performed when the user chooses the condition. For an example, let's describe the front-end part of the widget in script.js, which displays the settings inside the quick setup element. 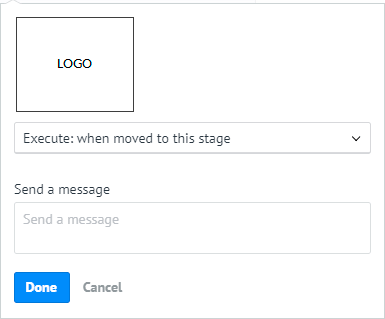 Select the sending of the message, upon the occurrence of any condition selected by the user (see screenshot above). Macros are used to automatically substitute data from entity cards into text messages. Thanks to the presence of macros in the integration, you can create universal text messages for a whole list of contacts, without the time spent on substituting data in each individual case. 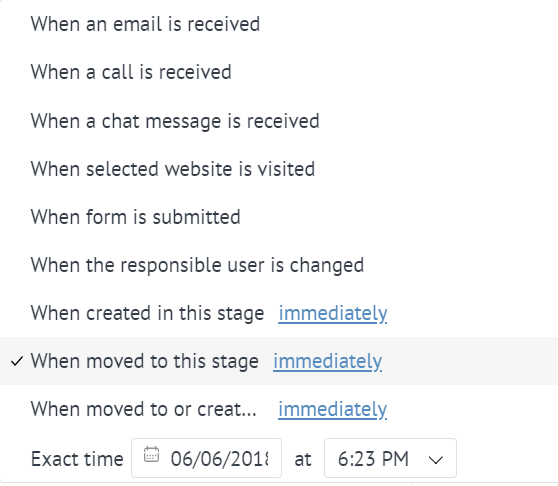 Next, you need to add the ability to specify macros in the message text in the quick setup area when you connect the widget in automatic actions for all leads in the digital pipeline. In the event that in your integration there is a function of sending out any information, then it may be useful for you to send information only to the main contact. In entities, the lead and the buyer can have more than one contact, so the implementation of the function of sending information only to the main contact can be useful to users. For example, one of the options for implementing this feature, for simple integration with a digital pipeline, which sends text messages. 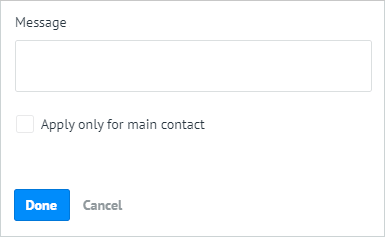 Next, you need to add the ability to select a distribution only to the main contact in the quick setup area, when you connect the widget in automatic actions for all leads in the digital pipeline. In the event that, based on the results of your widget, you need to enter the appropriate notification information in the entity card, then we recommend using the addition of a system event. For more information about events and their types, see here. Events are displayed in the cards along with the tasks, always in chronological order. To add a system event, you must specify note_type = 25. In the required text field, JSON is assigned in which two fields are indicated: text and service. In amoCRM there is an opportunity to connect, already implemented, salesbot'a. This bot can be programmed to perform certain actions. It helps to receive data from users via messengers (Telegram, Facebook Messenger, Viber). Each account in amoCRM at the advanced tariff and above has the ability to report on the actions to your web server. These "WebHooks" can be used to update information about leads in your store, send sms notifications or automate leads. Each WebHook can be configured for a specific operation and events.